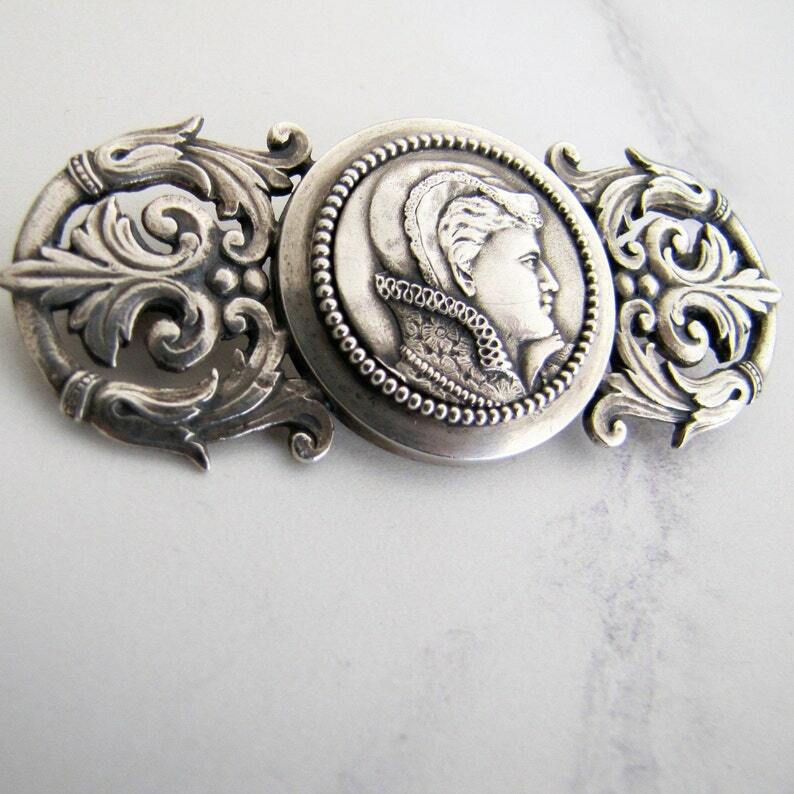 This is a beautifully modeled antique Scottish silver brooch depicting Mary Queen of Scots. The brooch features a central coin shaped portrait of Queen Mary surrounded by a beaded frame with the sides ornamented with thistles and fleur-de-lis. The decoration highly detailed right down to the Mary's floral patterned lace ruff. This is a solid good size brooch, superb quality with a the wonderful deep patina of antique silver. Highly unusual, an absolute beauty, Scottish in origin and we have never seen another piece quite like it! HALLMARKS: Stamped 'STERLING' on the reverse with a makers mark that is difficult to read. CONDITION: Excellent condition, the brooch has a sturdy heavy duty pin back with a t-hinge and c-clasp. Antique Scottish Silver Curved Sash/Tartan/Cloak Pin. Arts And Crafts Paste Ruby Poppy Brooch. Large Art Nouveau Plaid Buckle Brooch. Victorian Scottish Silver Granite Brooch, Jewelers Case. 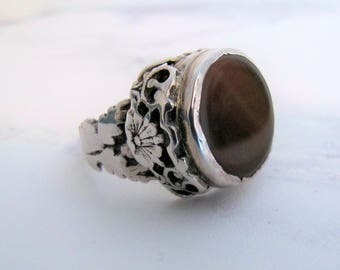 Antique Sterling Banded Agate Plaid Brooch. Massive Shoulder Sash/Tartan Pin.